Painted Rock Estate Winery, which John and Trish Skinner opened only two years ago, is on a roll. In the recent Canadian Wine Awards, Painted Rock was first among British Columbia wineries for the Winery of the Year award and third overall, just pipped by two Ontario wineries. Painted Rock entered 13 wines in competition and came away with three gold medals, four silvers and six bronzes. One of the three golds was the winery’s 2009 Red Icon, which finished second as the top British Columbia red after Church & State’s Coyote Bowl Syrah 2009. And at Sip Wines fourth annual tasting of B.C. Iconic Reds, Painted Rock Red Icon 2009 was scored in first place among the 19 great Okanagan and Similkameen blends. Sip Wines is a VQA wine store in Richmond. The first three tastings of “iconic reds” were held in the store. This year, the demand of Sip’s customers was so great that the tasting was moved to a room at the Richmond Country Club big enough to handle a sit-down tasting for more than 100. This is a very professionally-run tasting. To begin with, the wines were all decanted several hours before the tasting. These were all young wines made, in general, to be cellared for 10 or so years, in the tradition of great Bordeaux reds. Decanting the wines and letting them breathe accelerates their development and enables us to enjoy them sooner. The wines were served blind, one at a time, and in good stemware. No one, other than Sip proprietor Simon Wosk – who did not have a vote - had any idea what the order was until all the wines had been tasted and all the ballots were tallied. Guests at the event were able to order their favourite wines. When a winery agrees to enter its wine, Simon makes every effort to get an allocation set aside for attendees at the tasting. For the most part, these wines are produced in small volumes, with sales limited to the winery and to very few wine stores. There was one wine here that I had never even heard of. I suspect most of the attendees have not tasted most of these wines because they are so hard to get. For collectors of fine British Columbia wine, this tasting should be one of the highlights of the year. None of these wines disappoint. Only three of the wines has less than 90 points on my score card (one 88 and two 89s). The others ranged from 90 to 95: impressive winemaking! Here are my notes on the 19 wines in the order that they were ranked by the attendees. Painted Rock Red Icon 2009 ($55). This is a big, unfiltered red, a blend of Merlot (30%), Cabernet Franc (29%), Cabernet Sauvignon (25%), Petit Verdot (15%) and Syrah (1%). This is the third vintage of Red Icon and the first with no Malbec in the blend. It begins with aromas of spice, blackberry, black currant and dark cherry. It shows a rich texture with flavours of berries, plums, dark chocolate and vanilla. This is a wine, while still youthful and in need or cellaring, which has both power and elegance. Church & State Quintessential 2008 ($50). This is a blend of five Bordeaux varietals (the percentage of each is not available). Each varietal was aged separately in French oak for 12 months and then, after the wine was blended, it spent another 12 months in French oak. The wine soaked up the wood very well; it does not intrude on the vibrant aromas and flavours of red fruit (raspberry, cherry), with hints of mocha and red liquorice. The fine-grained tannins give the wine a supple, accessible texture. Laughing Stock Portfolio 2008 ($40). The wine is 53% Merlot, 24% Cabernet Sauvignon, 12% Cabernet Franc, 9% Malbec and 2% Petit Verdot. This is a big, satisfying wine with 14.6% alcohol. It shows spicy red berries and vanilla on the nose, flavours of plum and black cherries and ripe tannins that make the wine rich on the palate. Mission Hill Oculus 2007 ($70). This is 50% Merlot, 24% Cabernet Sauvignon, 21% Cabernet Franc, 5% Petit Verdot. It is a big wine with muscular, but ripe, tannins, a structure to enable to wine to age 10 or 15 years. The wine offers layer upon layer of flavour. The initial aromas were primarily oak and dark chocolate; plum and cherry aromas developed with time. On the palate, the flavour layers revealed plum, currants, figs, chocolate, with a hint of spice on the finish. Poplar Grove Legacy 2007 ($50). This is 71% Merlot, 17% Cabernet Franc and 12% Cabernet Sauvignon. Here is a wine that spent two years in barrel and another two in bottle before release. Even with all that barrel and bottle age, it retains vibrant flavours of currants and blackberries, aromas of plum and vanilla. The fine-grained tannins contribute to a full texture. CedarCreek “Colbert Edition” Platinum Reserve Meritage 2006 ($45 for a production of 144 cases). This is a blend of 40% Merlot, 31% Cabernet Sauvignon, 18% Malbec, 9% Cabernet Franc, 2% Petit Verdot. There are aromas of cassis, spice, vanilla leading to plum flavours with a hint of eucalyptus. The texture is still firm enough to suggest aging this wine a few more years. Why Colbert Edition? A few years ago, CedarCreek managed to buy 40 very expensive barrels made from a 350-year-old oak in the French forest of Bertrange. The story has it that the trees were planted under the directions of Jean-Baptiste Colbert, the finance minister to Louis XIV. Four of those barrels were used to age this wine for 19 months. Lake Breeze Tempest 2008 ($35). This is 50% Merlot and 25% each of Cabernet Sauvignon and Cabernet Franc. The wine begins with an attractive perfume of blueberries and cassis. Rich on the palate, it tastes of plum and black currant and red liquorice. The wine is elegant and balanced. Hester Creek The Judge 2007 ($50 for a production of 220 cases). This is a blend of Merlot, Cabernet Franc and Cabernet Sauvignon with about two years of barrel age and more than a year of bottle aging before release. It is a big wine with firm tannins, with mint, vanilla and black currants on the nose and with a complex flavour profile – currants, black pepper, figs, with a hint of liquorice on the finish. The 2008 vintage of The Judge has just been released through the winery’s website. Nk’Mip MəR’R’IYM 2009 ($50). This wine is a blend of 45% Merlot, 42% Cabernet Sauvignon Blanc, 5% Cabernet Franc, 5% Malbec and 2% Petit Verdot. In keeping with the winery’s name – which means marriage – this struck me as quite a pretty wine with sweet aromas of cherry and blueberries and with flavours of cherry and blackberry. Mission Hill Compendium 2008 ($40). This is 43% Cabernet Sauvignon, 28% Merlot, 26% Cabernet Franc and 3% Petit Verdot. This is a richly satisfying wine, beginning with appealing aromas of black cherries, vanilla and spice. On the palate, there are flavours of black currants and plums with notes of sage and tobacco. Fairview Cellars Bear’s Meritage 2008 ($35 but sold out). The blend is not available on the label but the minty note on the nose suggests this might be built around Cabernet Sauvignon. On the palate, the fruit flavours are vibrant, with notes of black currant and liquorice. There is also a taste of black chocolate in this interesting wine. The following two wines were tied. Black Hills Nota Bene 2009 ($53). This is 48% Cabernet Sauvignon, 41% Merlot, 11% Cabernet Franc, a fairly classic blend. Those who collect this wine will find this ripe, rich vintage reflects the house style that has been consistent throughout its history. There is vanilla, eucalyptus and dark fruits on the nose, with flavours of plum, black cherry and chocolate. The ripe tannins give the wine an immediate accessibility but it certainly will cellar well over the next five years. Osoyoos Larose Le Grand Vin 2007 ($45). This is 70% Merlot, 21% Cabernet Sauvignon, 4% Cabernet Franc, 3% Petit Verdot and 2% Malbec. I tasted this wine recently in a more leisurely setting at home and I reproduce those notes. This is a dark, concentrated wine with aromas of red fruit and cedar and with a complex palate of black currants, plums, coffee, chocolate, liquorice and cedar. On first opening, the tannins were firm and even a bit bitter on the finish, which is quite normal for a young red made in the Bordeaux style. Half a bottle was reserved for re-tasting on the second day, by which time the wine had rounded out to a rich palate with Christmas pudding flavours. If you must open the wine now, please decant it an hour or two ahead of time. If you can, put it away until at least 2015. Clos du Soleil Signature 2009 ($39.90 for a production of 275 cases). This is a blend of 41% Merlot, 28% Cabernet Franc, 20% Cabernet Sauvignon, 7% Petit Verdot and 4% Malbec. It presents a delicious array of red fruit flavours – currants, black cherries – with the added complexity of chocolate, fig and tobacco notes. The 18 months spent in French oak added a touch of cedar and vanilla. Mission Hill Quatrain 2008 ($45). This wine is either sold out or not released yet because it is not on the winery website. This is a blend of 34% Merlot, 29% Syrah, 22% Cabernet Franc and 15% Cabernet Sauvignon. The two Cabernets in this interesting blend seem to give the wine aromas of mint and cassis while the other two give the blend a lovely core of fruit – plum, black cherry, black currant. There is also a note of mocha. The wine still has a firm structure. LaStella Fortissimo 2009 ($35). This is 67% Merlot, 24% Cabernet Sauvignon, 12% Cabernet Franc and 8% Sangiovese. This wine has appealing aromas of black fruit and vanilla and these carry through on the flavours. The wine is still firm and a long way from peaking – but it will with patient cellaring. Herder Josephine 2008 ($50 with a production of 3,180 bottles). This is a blend of 81% Merlot, 15% Cabernet Sauvignon and 6% Cabernet Franc. Stated alcohol is 14.8%, again not an issue, given the fullness of the fruit and texture. The wine begins with dramatic aromas of spicy blackberries and blueberries. On the palate, there are flavours of blackberry and black currant, with the cedar notes often found in a Bordeaux-style red that has been aged in good oak. Clos du Soleil Eclipse 2009 ($Not released yet). The winery made just four barrels, about 100 cases, of this blend of 50% Merlot, 25% each of Cabernet Sauvignon and Cabernet Franc. The wine is quite Bordeaux in style, with concentrated textures, aromas of spice and mint and flavours of currant and blackberry. Osoyoos Larose Le Grand Vin 2008 ($100 for the magnum). This is a blend of 60% Merlot, 25% Cabernet Sauvignon, 7% Cabernet Franc, 5% Malbec and 3% Petit Verdot. Don’t be alarmed that this wine was at the end of the ratings. The wine is too young to reveal its potential, especially when served from a magnum. But this magnum will be spectacular in 2020. I thought it already better than this last place finish suggested, with a powerful aroma of dark fruit and plum jam. On the palate, there are notes of currants, dark chocolate, pepper and minerals. The texture is nicely concentrated. As it happens, Laughing Stock has just released the 2009 vintage, suggesting the 2008 could be hard to find. The wine was not in the Sip tasting but here are my notes on it. Laughing Stock Portfolio 2009 ($42 for a production of 1,990 cases). This is 36% Merlot, 27% Cabernet Sauvignon, 22% Cabernet Franc, 14% Malbec and 1% Petit Verdot, with an alcohol of 14.4%. In the style one has come to expect of Portfolio, this is a big ripe wine with aromas of red fruit, mocha and the oak that comes from its 19 months of barrel aging. Generous in texture, it has layers of flavour – plum, black currant, black liquorice – with ripe but firm tannins. This wine will cellar well. 92. The couple that brought you the Black Hills winery and Nota Bene are back in the wine business. Senka and Bob Tennant have just released the first wine, a white called Figaro, from Terravista Vineyards, their new winery high on the Naramata Bench. The Tennants, along with Susan and Peter McCarrell, opened Black Hills in 2001 and sold it in 2007 when the McCarrells retired. After taking a few years off, the Tennants returned to wine growing in 2009 when they began to plant a 1.6-hectare (four-acre) and to develop a winery with an unusual focus for the Okanagan. Terravista Vineyards has only Albariño and Verdejo, two Spanish white varieties never grown before in the Okanagan – and probably not in Canada. The couple travelled in Spain during the 2008 vintage there, picking the brains of growers and winemakers. They also buy white Rhône varieties and are launching the winery with two blended whites. It was not easy to get even the small quantities of vines they needed. The University of California had just released disease-free stock; nurseries were scrambling to build up stocks of vines to meet the strong demand for these somewhat exotic varieties. The Tennants received just enough vines in 2009 to plant a quarter of the vineyard and some of those vines were killed in a freeze that fall. It was not until 2011, with their new winery under construction, that they got enough vines to finish planting Terravista. The 600-square-metre (2,000 square-foot) winery, set into a hillside and partly below ground, is designed exclusively for producing only small volumes of white wine, with production capped at less than 2,000 cases a year. The winery and vineyard are uphill from the Kettle Valley Trail and offer dramatic views of the Naramata Bench. However, there is no wine shop, nor are there plans to open one. The fans of Senka Tennant’s winemaking will just have to pick up the telephone (778-476-6011) and order. “Our intent is to sell our wine through our agents to restaurants and stores, and to people who are interested in ordering from us,” Bob says. The first release is 220 cases of Figaro 2010 ($24 a bottle), made with grapes purchased from neighbouring vineyards and also from a grower in Osoyoos. This is blend of Roussanne, Viognier and Marsanne. The white blend from their Spanish varietals, due for release next year, will be called Fandango. Both wines are made in a crisp, dry style, suiting the varieties and also suiting the palates of the owners. 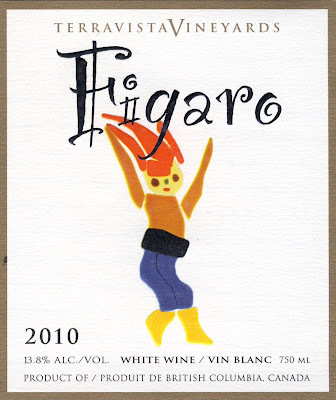 Here is a tasting note on Figaro 2010. The wine begins with appealing aromas of melons, apples and apricots. It delivers a complex array of flavours - apples, citrus, honeydew and apricot - with a fine spine of minerality and with satisfying weight on the palate. The finish is crisp and dry. 90. Vancouver businessman and angel investor Bruce Schmidt has just opened the Okanagan’s newest winery, Intersection Wines, by hand-selling its two first releases to restaurants and wine enthusiasts. Bruce is hardly a stranger to the British Columbia wine industry. He was the national marketing manager at Calona Wines in the early 1980s when Schloss Laderheim became the best-selling domestic white wine in Canada. In the early 1990s, he ran a company that helped raise financing for the start of Blue Mountain Vineyards & Cellars. He remained a Blue Mountain shareholder for 18 years and regards that winery as an example of how to do things correctly in the wine business. In his non-wine life, he has run start-up life sciences companies. He is currently chief executive of Carrus Capital and plans to continue in that business as well as run the winery. “I have way too much fun in science to give it up at this point,” he says. “Also, the winery can tolerate that now. We don’t have such a large production now.” Intersection opened with about 1,000 cases of wine and is targeting 2,500 cases when its vineyard is in full production. Bruce, who has a silent partner in the winery, began looking for Okanagan vineyard property in 2002, buying a former orchard, with a packing house, at the intersection of Highway 97 and Road 8 in 2007. The location inspired the winery’s name, along with the bright X on the labels and the website, which is www.xwine.ca (still under development). The property now has 20,000 closely-packed vines on four hectares (10 acres). Half of the vines are red varieties (Merlot, Cabernet Franc) and the other half are whites (Sauvignon Blanc, Viognier, Marsanne, Riesling). The wines are made by Summerland wine consultant Philip Soo. The wines released so far are good and quite fairly priced for their quality. “At this point the wines are only available directly from the winery,” Bruce says. “As I am back and forth from Vancouver on a regular basis, I can easily arrange to get people some wine. Once we have a bit more inventory, we will certainly seek some private store listings.” The current telephone number for ordering wine is 604.760.0160. Intersection 2010 Mile’s Edge White ($20). This is a blend of Sauvignon Blanc and Viognier (the blends may change from vintage to vintage). Fermented in stainless steel, the wine begins with appealing floral and fruity aromas (apricots, pineapples). On the palate, there are flavours of green apple, melon and citrus, with the defining mineral spine that Viognier brings to the party. The finish is crisp and refreshing. 90. Intersection 2009 Unfiltered Merlot ($25). Bruce believes that his vineyard delivers quite unique terroir notes in the Merlot. This elegant wine’s appeal begins with its lovely dark hue and its smoky aroma, mingled with aromas of blueberry, black currant and black cherry. These are echoed on the palate, which is bold and concentrated. This wine deserves to be cellared for a few more years to reach its full potential. 90-92. Meyer Family Vineyards opened early in 2008 and initially produced only Chardonnay from its Old Main Vineyard on Naramata Road. Then JAK Meyer bought the Mclean Creek Road Vineyard at Okanagan Falls late in 2008 and, shortly after that, hired winemaker Chris Carson, a Canadian trained in New Zealand, who is passionate about Pinot Noir. The result is the addition of several Pinot Noirs to the portfolio, along with more Chardonnay and, on occasion, Gewürztraminer because the Mclean Creek Road Vineyard includes varieties other than the two core varieties for Meyer. The latest releases reflect good grape growing and good winemaking. Chris’s general approach with Pinot Noir involves pressing the grapes gently and leaving about a quarter of the clusters whole. After several days of cold soak, fermentation is begun with a mix of indigenous and cultured yeasts. He allows the ferment to progress slowly, peaking at a warm 33ºC. He opts for post-ferment maceration before pressing off the wine and transferring it to French oak (a mix of new and used barrels) for about 10 months. Malolactic fermentation takes place naturally in the late spring. This is fairly typical winemaking with Pinot Noir in the many places where the wine is made. Meyer 2010 Mclean Creek Road Vineyard Chardonnay ($35 for 216 cases). This appealing Chardonnay is focussed with laser-like purity of fruit, the result no doubt of a long, cool fermentation in stainless steel before finishing its ferment in French oak barrels. The wine spent 10 months in barrel, on the lees but without stirring. The wine begins with aromas of citrus and light butterscotch. On the palate, there are flavours of citrus and apple, very subtly supported by oak. The finish is crisp and bright. 91. Meyer 2010 Old Main Vineyard Chardonnay – Tribute Series ($35 for 660 cases). Each vintage, the winery releases one Chardonnay that gives tribute to a British Columbia achiever, with some of the proceeds directed to an associated cause. This wine is dedicated to Sonja Gaudet, a national and world champion wheelchair curler. With this wine, they have done her proud. It is made from grapes grown on 15-year-old vines in the Meyer vineyard on Naramata Road. The winemaking here is similar to that of the Mclean Creek Chardonnay. The wine has a hint of toast mingled with the citrus aromas. On the palate, the fruit is lush – citrus, ripe apple, a touch of butterscotch – without any of the heaviness one sometimes finds on oaked Chardonnay. This wine is bright and fresh and also shows a laser-like purity. 92. Meyer 2009 Mclean Creek Road Vineyard Pinot Noir ($40 for 52 cases). This wine will be released in the spring of 2012 because the winery thinks it needs still more bottle age to show its best. Provided it is decanted now and allowed to breathe, the wine is already impressive. Dark in hue, it has a rich, fruity aroma of cherries and raspberries. On the generous palate, there are layers of fruit including cherry and plum. On the finish, there is a note of spice and sage. 92. Meyer 2010 Mclean Creek Road Vineyard Pinot Noir ($40 for 168 cases). This vineyard grows five different clones of Pinot Noir, giving the winemaker options for building a complex wine. This again is a fine, dark-hued Pinot Noir, with aromas of spice and cherries. On the palate, the vibrant fruit again is layered, with notes of strawberry and cherry. The texture is generous with the classic suppleness of this varietal. The wine is still youthful and should be cellared for a few years to reach its potential. 91. Meyer 2010 Okanagan Valley Pinot Noir ($24.90 for 550 cases). The grapes for this wine are from the Canyon View Vineyard, which is on a terrace overlooking Trout Creek Canyon at Summerland. The wine is a medium-bodied charmer with a vibrant ruby hue and bright aromas strawberry verging on cherry. On the palate, the wine has the variety’s silky texture with flavours of spice and strawberry. 90. The latest release from Quails’ Gate Estate Winery is a rather odd coupling again. I grumbled last year about a similar pairing but the fact is that Quails’ Gate’s best red and its most rustic reds are ready for release at the same time. The winery has long had a cult following for its Old Vines Maréchal Foch – so much so that it makes two such wines each year, one from its vineyard in West Kelowna and another from a vineyard near Osoyoos. The winery also has a strong following, deservedly so, for its Pinot Noirs. I suspect these are varietals that appeal largely to different consumers. Elegant Pinot Noir is a cerebral wine (think of people who appreciate ballet and the opera). Robust Maréchal Foch jumps from the glass and smacks you in the mouth (think of patrons of football, if not mixed martial arts). Succeeding in the wine business, obviously, is a matter of satisfying a range of tastes. There is no doubt that Quails’ Gate is a successful winery. Maréchal Foch is a French hybrid variety that once was widely grown in British Columbia. Most of it was pulled out in 1988 to make way for vinifera varieties. Not all plantings, however, were pulled out (and there are a number of new plantings of this winter hardy workhorse). The two blocks that Quails’ Gate owns were 46 years old and 27 years old in 2009, the vintage of these two releases. There are few plantings of any variety in British Columbia that are that old. Vintners tend to prize old vines because the grapes usually are much more intense in flavour compared with grapes from young vines. The trio of wines just released include both Maréchal Foch wines as well as the most polished Pinot Noir that Quails’ Gate has ever released. The winery certainly has raised the bar for Pinot Noir. Quail’s Gate Pinot Noir Dijon Clone Selection 2008 ($55 for a production of 440 six-pack cases). Quails’ Gate grows seven or eight clones of Pinot Noir but for this wine, winemaker Grant Stanley chose what the winery considers the best and oldest (12 years) Dijon clones in the vineyard – clones 115 and 667. The result is a wine of exceptional elegance and purity. It begins with alluring cherry aromas. On the silky palate, there is layer after layer of sweet berry flavours – cherry, strawberry, raspberry. There is a backbone of fine tannins, suggesting that this wine will age well. Unfortunately, it is so seductive and charming already that very few bottles are likely to be cellared. 94. Quails’ Gate Old Vines Foch Reserve 2009 ($40 for a production of 2,045 six-bottle cases). This wine is from the 46-year-old West Kelowna block. The winery has been producing an Old Vines Foch from this block since 1994 when their winemaker at the time, Australian Jeff Martin, patterned the flavour profile on old vines Shiraz. This release is a typically bold, dark and brooding red with 15% alcohol. It begins with an almost meaty aroma; the spicy overtones reminded me of a good pâté. As the wine breathes, aromas of plum, fig and chocolate also emerge. On the palate, there are flavours of fig and plum, with a hint of mocha subtly supported by oak. A cut-with-your-knife wine, it demands a pepper steak. 90. Quails’ Gate Old Vines Foch 2009 ($25 for a production of 2,072 cases).This is from 27-year-old Foch grown in the winery’s Osoyoos vineyard. Perhaps it is the extra heat or the sandy soil, but these grapes never quite develop the power of the West Kelowna Foch even if this is also 15% alcohol. No doubt, there are palates which will prefer the slightly leaner style. This wine begins with the variety’s gamey aromas. On the palate, there are flavours of black cherry and chocolate with spicy fruitcake on the finish. 88.